Tony was put down Monday evening, after his health declined due to kidney failure, the statement says. A necropsy will be done by veterinarians to learn more about Tony’s illness. Sandlin could not be reached Monday night for comment. Back in April, he denied that Tony was suffering and said the tiger was seen regularly by a veterinarian, limped from arthritis and only had loose stools after getting anti-worm medicine. “He is not sick. He’s simply an old man with some arthritis,” Sandlin had said. 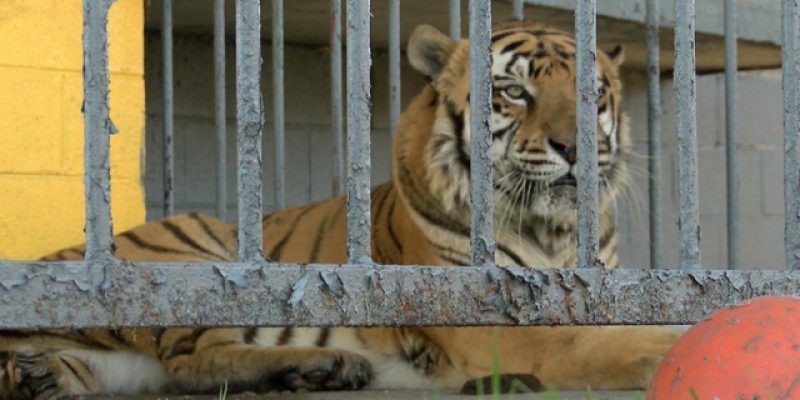 Despite repeated attempts by animal rights groups to have Tony removed from the roadside attraction over the years (including some that remained ongoing), Tony remained there until his death, which by all appearances was not usual or untimely for a tiger in captivity. However, legitimate questions had been raised about the quality of his enclosure and the propriety of using a wild animal in such a way. Fair-minded people fell down on both sides of the debate. The watershed moment for Tony’s legal status came in 2014 when legislation was passed passing a specific exemption for Tony. Nevertheless, an existing petition on “SAVETONY.com” is prefaced by the tagline: “They are trying to make sure our exhibit is closed after Tony dies! NEW PETITION! IMPORTANT! PLEASE SIGN NOW! !” The fight may well continue. Previous Article Who’s Up For Watching An LSU-Auburn Replay?